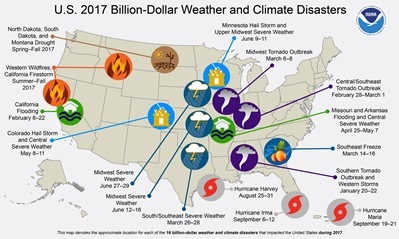 NOAA has tallied up the losses from 16 billion-dollar weather and climate disasters that hit the United States during 2017, and the agency says their combined $306 billion in losses set a new U.S. record. NOAA on Jan. 8 posted a map showing the year's billion-dollar weather and climate disasters. The biggest among them were the western U.S. wildfires that caused damages tallying $18 billion, which tripled the previous U.S. record, and Hurricane Harvey, with losses topping $125 billion (which ranked second only to Hurricane Katrina, the costliest storm in the 38-year period of record). Hurricanes Maria and Irma had total damages of $90 billion and $50 billion, respectively, and Hurricane Maria now ranks as third-costliest weather and climate disaster on record for the nation, with Irma being the fifth costliest. Since 1980, the United States has sustained 219 weather and climate disasters that have exceeded $1.5 trillion in overall damages to date, according to its report.